Colton's Map of New Yor and the Adjacent Cities. This is a beautiful J. H. Colton map of New York City and vicinity, including Manhattan as well as parts of Brooklyn, Jersey City, Hoboken, and Queens. This is the fourth state of the Colton New York City map in which Central Park is depicted according to the Olmstead plan. This edition also various from previous editions in the labeling of the various ferry crossings and the addition of new line to the Long Island Railroad (L.I.R.R.). In general Colton offers wonderful attention to detail and notates individual streets, important buildings and parks. This important map is almost iconic in that is one of the first widely distributed commercial maps to depict Manhattan as a singular urban unit. 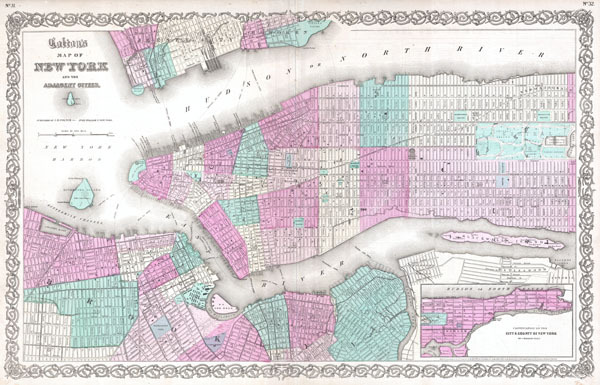 Following its inception in 1855, this map would become the template from which Johnson and later S. A. Mitchell Jr. would build their own New York City maps. Originally prepared as plates no 31 and 32 in J. H. Colton's 1863 issue Atlas of the World. Though the map itself was updated, Colton rarely updated his copyrights - this map is dated and copyrighted: 'Entered according to the Act of Congress in the Year of 1855 by J. H. Colton & Co. in the Clerk's Office of the District Court of the United States for the Southern District of New York.' Published from Colton's 172 William Str. Office in New York. Colton, G.W., Colton's Atlas Of The World, Illustrating Physical And Political Geography., (1863 editon). Rumsey 0149.024 (1856 edition). Haskell, D., Manhattan Maps: A Co-operative List, 1013-1021. Phillips (atlases) 816.